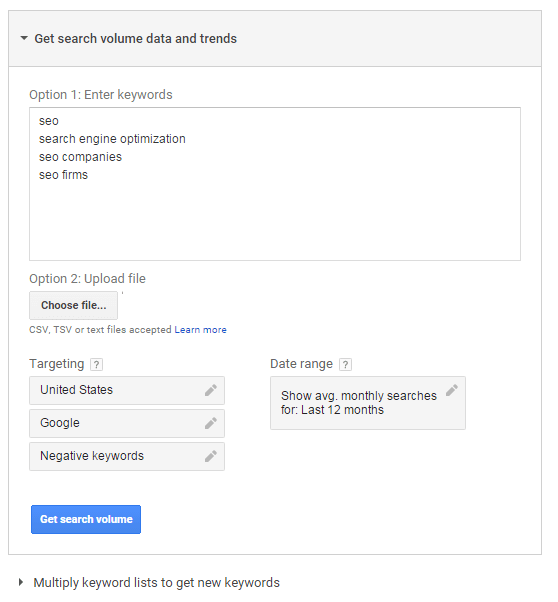 How Do I Compare Keyword Search Volume? Which Keywords should I use? This problem comes up a lot for SEO specialists when they are writing titles and meta descriptions for the pages on their website. Depending on the industry, there might be two popular keywords that you are trying to decide between. You could even be trying to decide between two variations of the same word. If only there was a way to see which search term gets used more! We have the solution to your problem! 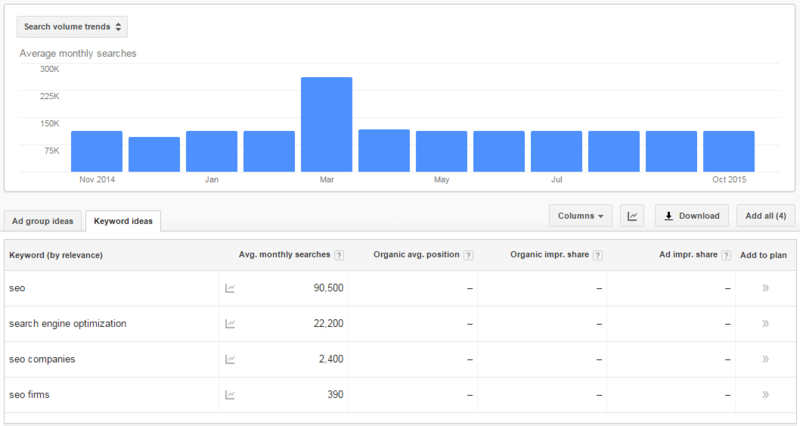 You can use the Keyword Planner tool in Google Adwords to see estimated monthly search volume for any particular keyword. Once you have your account set up, log in and select “Tools>Keyword Planner” in the main menu. Next, click on “Get search volume data and trends” and it should bring up a text box for you to type the keywords that you want to compare. There are additional options for uploading an Excel spreadsheet of keywords and options for adjusting targeting and date range. Below is an example of how to compare a couple different keywords. “SEO” vs “search engine optimization” and “seo companies” vs “seo firms.” Simply enter one keyword per line and click the blue “Get search volume” button. When you click “Get search volume” it will show you a bar graph of average monthly searches as well as the search volumes for each keyword. With the given information, you can easily decide which keyword is more popular and which one you should use in your titles and meta descriptions.